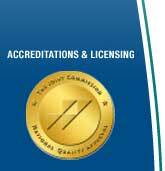 The Joint Commission’s mission is to improve the safety and quality of care provided to the public. To maintain and earn accreditation, Oasis Surgery Center must have an extensive on-site review by a team of Joint Commission health care professionals. This is the gold standard and the highest achievable standard any surgery center can attain. We have held this distinction continuously since 1997. Oasis Surgery Center is licensed thru the State of California Department of Public Health. Maintaining this license means the center complies with all of the States’ laws governing surgical clinics. Our last unannounced visit by State surveyors resulted in “no deficiencies,” a perfect score that is very rare. The Center cares for patients with Medicare insurance coverage. We have been a Medicare provider since 1997 and comply with all of the CMS standards. Oasis Surgery Center is a member in good standing of the California Ambulatory Surgery Association and on the national level the Ambulatory Surgery Association (formerly FASA) since 2003. © 2010 Oasis Surgery Center - San Diego, all rights reserved.